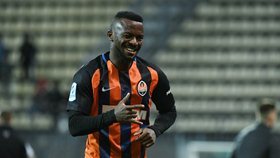 Shakhtar Donetsk coach Paulo Fonseca was pleased with the performance of Olarenwaju Kayode against Zorya, after the Manchester City loanee netted two minutes into his debut for the Ukrainian powerhouse. Despite spending only few minutes on the Slavutych-Arena (Zaporizhzhya) turf, the Portuguese manager has described Kayode's performance as perfect. ''In the few remaining minutes he scored. Just perfect! No matter how much time is left - one, five, ten or twenty minutes - a football player should behave appropriately, showing dedication and efficacy on the pitch,'' Fonseca told reporters, according to shakhtar.com. Kayode represented Luzern, Maccabi Netanya, Austria Wien before transferring to Manchester City last summer. Shakhtar have an option to buy the Nigerian international from his parent club City at the end of the 2017-18 season.